Our Tipperary Grass Seed brand is a market leader throughout Ireland with our flagship grass seed mixture ‘No 4A’ used in every county in Ireland. Our agricultural grass seed range have long enjoyed a reputation for mixtures of high digestibility, yield and longevity and the preference with Irish farmers. 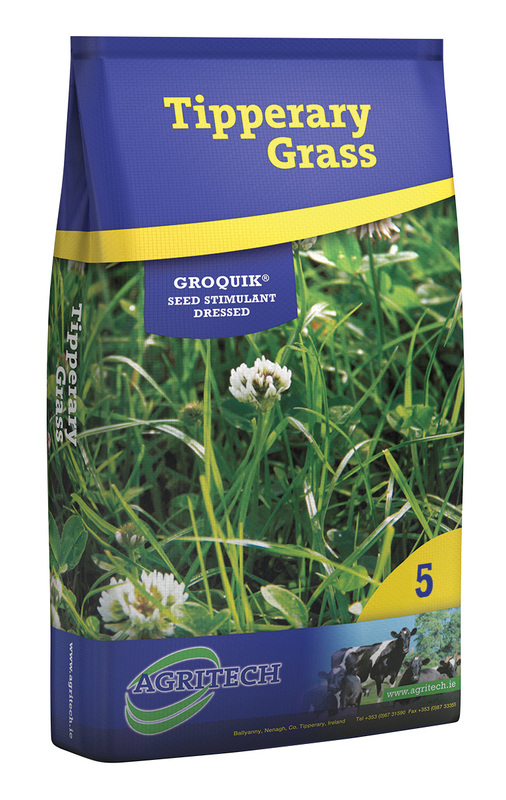 The application of our unique GroQuik ® dressing to all of our grass seed and clover mixtures helps to ensure optimal germination, establishment and increased yield in new grass leys. Our flagship premium mixture is specially formulated to produce high yielding leafy pasture for long term intensive grazing and high quality silage. Tipperary 4A has been refined over many years to now become a market leader playing a key role on grassland farms today ensuring that the maximum return is achieved from grass leys. It successfully encompasses all of the key traits required in a grass seed mixture for the modern grassland farmer. GroQuik® dressed for enhanced germination and dry matter yield. Higher animal performance – increased milk, milk solids and liveweight production. Longer lasting with excellent persistency. Higher palatable swards with higher animal intakes. Contains 1kg of clover for increased nitrogen efficiency and herbage output. Also, suitable for high D value silage. Selection of the best available varieties on the market based on research trials. A grazing mixture designed with the option of a late cut of silage delivering quality, yield and persistency for all round performance. Comprised of late heading perennial ryegrass. Productive swards in spring and autumn. High performance in both cutting and grazing regimes. Clover performs well in both regimes. Option of similar mixture without clover, 4XC. Suitable for cattle or sheep. This general purpose ley is suitable for less demanding farming systems looking for good grazing and the potential to produce good quality silage. A versatile multi-purpose long term mixture suitable for grazing and/or cutting. Produces high quality silage yields from mid-May onwards suitable for hay cutting later in June. A mixture of late and intermediate varieties, selected for excellent seasonal distribution of yield and increased palatability. Excellent mid-season and late growth maintaining good summer production and extended autumn grazing. Ideal mixture suitable for cattle or sheep. A specially formulated mixture of late tetraploid perennial ryegrass to extend the life of an existing sward maintaining productivity of yield and quality. Overseeding can improve an existing sward with the addition of new seed without the cost of a full reseed. The inclusion of a larger late tetraploid seed allows it to establish and compete with existing sward. GroQuik® dressed for faster germination. An equine mixture formulated to cater for diverse needs providing nutritious, persistent and palatable pastures. Suitable for hay, haylage or as a grazing mixture. Minimal poaching damage due to inclusion of strong creeping red fescue, smooth stalked meadow grass and dwarf perennial ryegrass. This 2-cut silage mixture has a tall erect growth habit to give a cleaner and better crop at cutting. Producing a high quality and high energy crop. Contains intermediate and late heading varieties. High sugar content to aid fermentation. Formulated with varieties for high digestibility and yield for silage. Cutting date from mid-May to optimise quality and yield. Excellent persistency and sward density. Produces high quality grazing for cattle and sheep. Hybrid ryegrass is a cross between perennial and Italian ryegrass combining yield, quality and persistence. Types range from perennial ryegrass to intermediate and Italian types. Usage has mainly been for conservation, but the new perennial types have proved to be excellent for grazing. Hybrid ryegrass has improved drought tolerance compared to Italian ryegrass, especially the very dense hybrids. Spring growth is similar to early perennial ryegrasses whereas the heading is more like intermediate perennials. This gives a great deal of flexibility in the spring and high quality forage. A hybrid ryegrass mixture for farmers who demand high yield from multiple cuts of silage. Hybrid ryegrass and red clover are the ideal companions with erect growth habits making it most suitable for cutting. Will facilitate at least 3 cuts of silage with quality aftermath grazing. High yielding short term mixture of 3-5 years. Extra protein, 15-20% from red clover. A hybrid mixture suitable for intensive cutting or grazing giving excellent spring growth and high total annual yields. This mixture is a short term mixture of 3-5 years with the option of inclusion of red or white clover. Very high yields in comparable to perennial leys. Suitable as an overseeding mixture to maintain production and extend life of the sward. Particularly suited to overseeding a cutting sward but optional with grazing. For further information about our Tipperary Grass Seed mixtures and prices, contact your local distributor.